That title was Wyatt's suggestion. I should let you know a few things: 1. It's about me 2. I was not drunk, but I did drink a glass of wine very quickly and 3. I am no model! Wyatt did my little photo shoot last night to make a banner for this here blog. He has his own little studio at his place and it was unnerving to be under all those lights in front of a camera! I don't like so much attention. Luckily this was after our Insanity workout so my friends (two of which are his roommates) were around to help me laugh and pick outfits and jewelry. Wyatt says, "Bring a few different shirts and we will take some pictures!" Except I'm a girl. And we were going to work out first. So I had to clean up. And bring make-up and hair stuff. And several shirts. And a couple sets of jewelry. And other hair accessories in case I wanted to change my 'do for a set of pictures. 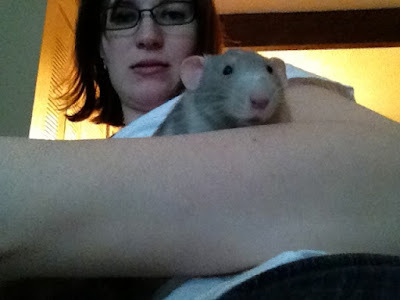 This is the picture I will be known by from now on, you know? And I don't like pictures of myself generally so it was kind of a big deal. Talk about intimidating. I got ready and downed my glass of wine to help me loosen up. I hope it worked. I haven't seen any of the pictures yet. I guess I am Wyatt's new project. He's trying to help this little blog go big. I hope I am up to the challenge. Half the time I'm not even sure what to blog about! Oh well. 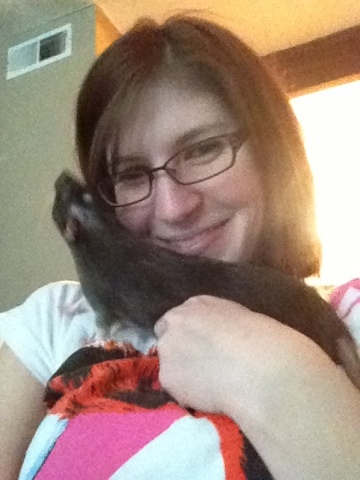 On a side note, here are some pictures of me with my ratties! They are so cute! I don't much mind taking pictures with them (the attention is on their cute little faces after all).